It's almost time, kids! Halloween comes early this year, thanks to Fright-Rags. 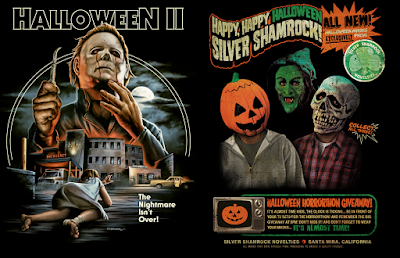 The horror apparel company has launched pre-orders for officially-licensed Halloween II and Halloween III: Season of the Witch shirts. In 1981, Michael Myers returned for more of the night he came home in Halloween II. Artists Justin Osbourn, Marc Schoenbach, Nathan Thomas Milliner, Chris Lovell, Matt Tobin and Paul Shipper pay tribute to the first sequel to John Carpenter's classic slasher. 1982's Halloween III: Season of the Witch does not follow the Michael Myers storyline, but the entry has gone on to develop a cult following. Artists Justin Osbourn, Matt Tobin, Steve Sampson and Kyle Crawford take on one of horror's most misunderstood movies. Put on your Silver Shamrock mask, gather 'round your computer and pre-order the Halloween II and Halloween III collection now at Fright-Rags.com. All 11 designs can be purchased on unisex shirts or girls tees. Several are also available on zip-up hoodies and/or baseball tees. They will ship in early-October to ensure domestic delivery by Halloween. Items are limited and may sell out during the pre-order period.